one or more risk factors for extravasation. For example they tend to be older, meaning they are more likely to have fragile, thin and/or mobile veins.3 Chemotherapy extravasation can cause a wide range of symptoms, which vary according to the amount or concentration, and nature of the extravasated drug. Agents are separated into three broad categories on the basis of their mechanisms of cellular damage and potential to cause tissue injury: vesicants, irritants, and non-vesicants.6,8 Refer to Table 2. Note that some irritants may act like vesicants if a large volume or high concentration is extravasated. Non-vesicants rarely produce a reaction, but for other agents initial symptoms occur immediately after extravasation. There is usually acute pain (from mild to intense), and, within hours, this is usually followed by erythema and oedema surrounding the injection site. Initial symptoms are usually similar no matter the causative agent, however the progression beyond these initial symptoms differs greatly between irritants and vesicants.6,10,11 Irritants usually cause only a mild inflammatory reaction as described above. Symptoms are usually of short duration and long-term effects are rare. Vesicants, on the other hand, have the potential to cause severe and lasting injury. Tissue destruction may be progressive and slow, taking weeks to manifest. This can progress to ulceration and even necrosis, which may damage underlying structures such as nerves, muscles and joints. Occasionally the damage may be so severe that function cannot be recovered in the affected area.6,8,10 Of the vesicants, anthracyclines have the greatest potential for injury. This is due to their mechanism of action. Drugs that bind nucleic acids in DNA (e.g. anthracyclines) cause cell death and lysis, which allows the drug to affect surrounding cells. This repetitive process can result in progressive and chronic tissue injury. Drugs which donâ&#x20AC;&#x2122;t bind to DNA can potentially be metabolised and cleared, limiting tissue injury. Because of the extent of injury which they can cause, and because they are in widespread use, anthracyclines are one of the most important chemotherapy agents to consider with regards to extravasation. Continued on page 4. (e.g. medication treatment rooms), and at the point of care (e.g. in folder with medication chart) ¬¬ Communicate information about the changes to all prescribers, including visiting medical officers, and table at Medical Advisory committees, and specialty medical practice committees/ craft groups. 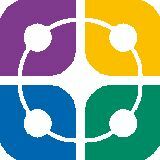 ¬¬ Include in medication related learning and development programs for nursing and pharmacy staff. 2. Include both the old and new name on shelf labels where medications are stored. Where a significant name change necessitates a change in the storage sequence, strategies should be to ensure that medicines can be easily located, e.g. implemented (e.g. “shelf talkers”, signs on/inside imprest cupboard doors. 3. Ensure universal application of new medicine names to embed throughout clinical practice: review all local policies, procedures, guidelines and resources, including documents provided to patients, containing medicine ingredient names that are changing and update them to include both the old and new name. 4. Ensure any applicable name changes are highlighted in medication counselling with patients and/or carers. Health services should conduct a local risk assessment of the impact of these name changes when deciding which are the most appropriate and effective risk mitigation strategies for their clinical environment and patient mix. Ongoing monitoring and evaluation of the effectiveness of these strategies by the appropriate clinical governance committee(s) should continue throughout the extended transition period. Any medication incidents/near misses arising from confusion due to these medicine name changes must be reported and investigated to determine if any further strategies are required to further improve patient safety. Over the next few years a sustained and consistent effort will not only be required by the health services in managing the risks outlined above, but also by health professionals in changing their practice to ensure the transition to the international medicine names is completed in the safest manner possible for patient care. References are available on request. Note: there are other practitioners in areas such as those in nuclear medicine and diagnostic imaging that are also affected by the name changes. should not be taken more than once per night due to its long half-life and increased risk of adverse effects at higher doses. There is no evidence available for its use in patients with either severe renal or hepatic impairment, pregnant or breastfeeding women, or children.6 Therapy should be reviewed following three months of regular use. Following cessation of recommended doses of suvorexant there is no evidence of physical dependence, rebound insomnia or effect on sleep onset or maintenance.4 References are available on request. the antidote dimethylsulfoxide (DMSO) should be applied topically. DMSO has free-radical scavenging properties and improves absorption of extravasate. For vinca alkaloids, warm compresses will cause vasodilation and increased blood flow which helps to dilute and disperse the extravasate. The antidote used is subcutaneously injected hyaluronidase (an enzyme that breaks down bonds in soft tissue) which helps the extravasate disperse, reducing its local concentration. If tissue damage persists despite these measures, surgery and skin grafting may be indicated to excise necrotic tissue.9,11 While chemotherapeutic extravasation is rare, the consequences can be severe and long-lasting. It is crucial that healthcare professionals are aware of the risks, and trained in the protocols for prevention and management. References are available on request. If you have any queries regarding Circuit content and authors please contact the Epic Pharmacy Practice Unit by email: PharmacyPractice@epicpharmacy.com.au Every effort has been made to ensure this newsletter is free from error or omission. 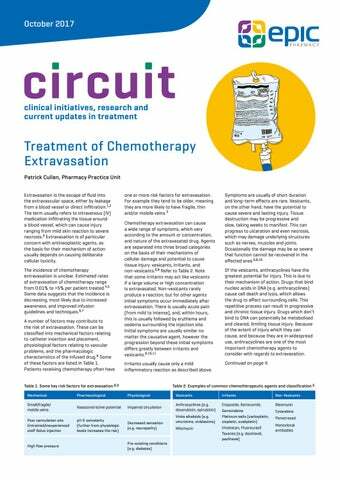 In this issue: Treatment of Chemotherapy Extravasation, Medicine Name Changes, New Drug Brief: Suvorexant.